First dorsal compartment, including the abductor pollicis longus and extensor pollicis brevis tendons. Repetitive radial and ulnar deviation of the wrist, associated with flexion of the thumb, causes thickening of the tendon sheath and pain when the inflamed tendons cross the distal radial styloid. Physical examination is significant for tenderness at the distal radial styloid. The Finkelstein test is positive in these patients—that is, pain is elicited when the patient makes a fist with the thumb tucked in and the wrist is rotated in the ulnar direction. Steroid injection is efficacious when standard conservative treatment fails. 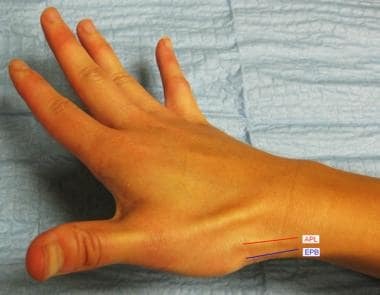 Thumb injection is indicated for the treatment of de Quervain tenosynovitis. Contraindications for thumb injection include local infection and allergy to the chosen anesthetic or corticosteroid. Rankin ME, Rankin EA. Injection therapy for management of stenosing tenosynovitis (de Quervain's disease) of the wrist. J Natl Med Assoc. 1998 Aug. 90(8):474-6. [Medline]. de Quervain F. On a form of chronic tendovaginitis by Dr. Fritz de Quervain in la Chaux-de-Fonds. 1895. Am J Orthop. 1997 Sep. 26(9):641-4. [Medline]. O'Neill CJ. de Quervain tenosynovitis. Frontera WR, Silver JK, Rizzo TD Jr, eds. Essentials of Physical Medicine and Rehabilitation: Musculoskeletal Disorders, Pain, and Rehabilitation. 3rd ed. Philadelphia: Elsevier Saunders; 2015. 136-9. Wolf JM, Sturdivant RX, Owens BD. Incidence of de Quervain's tenosynovitis in a young, active population. J Hand Surg Am. 2009 Jan. 34(1):112-5. [Medline]. Rettig AC. Wrist and hand overuse syndromes. Clin Sports Med. 2001 Jul. 20(3):591-611. [Medline]. Ilyas AM. Nonsurgical treatment for de Quervain's tenosynovitis. J Hand Surg Am. 2009 May-Jun. 34(5):928-9. [Medline]. Peters-Veluthamaningal C, van der Windt DA, Winters JC, Meyboom-de Jong B. Corticosteroid injection for de Quervain's tenosynovitis. Cochrane Database Syst Rev. 2009 Jul 8. CD005616. [Medline]. Saunders S, Longworth S. Injection techniques of the upper limb. Injection Techniques in Orthopaedic and Sports Medicine. 3rd ed. Philadelphia: Elsevier Churchill Livingstone; 2006. 41-84. Zayat AS, Buch M, Wakefield RJ. Aspiration and injection of joints and soft tissues. Firestein GS, Budd RC, Gabriel SE, et al, eds. Kelley's Textbook of Rheumatology. 10th ed. Philadelphia: Elsevier; 2016. Vol 1: 802-16.
van Middelkoop M, Huisstede BM, Glerum S, Koes BW. Effectiveness of interventions of specific complaints of the arm, neck, or shoulder (CANS): musculoskeletal disorders of the hand. Clin J Pain. 2009 Jul-Aug. 25(6):537-52. [Medline]. Huisstede BM, Gladdines S, Randsdorp MS, Koes BW. Effectiveness of conservative, surgical, and post-surgical interventions for Trigger finger, Dupuytren's disease, and De Quervain's disease. A systematic review. Arch Phys Med Rehabil. 2017 Aug 28. [Medline]. Mardani-Kivi M, Karimi Mobarakeh M, Bahrami F, Hashemi-Motlagh K, Saheb-Ekhtiari K, Akhoondzadeh N. Corticosteroid injection with or without thumb spica cast for de Quervain tenosynovitis. J Hand Surg Am. 2014 Jan. 39 (1):37-41. [Medline]. Richie CA 3rd, Briner WW Jr. Corticosteroid injection for treatment of de Quervain's tenosynovitis: a pooled quantitative literature evaluation. J Am Board Fam Pract. 2003 Mar-Apr. 16(2):102-6. [Medline]. To P, McClary KN, Sinclair MK, Stout BA, Foad M, Hiratzka S, et al. The Accuracy of Common Hand Injections With and Without Ultrasound: An Anatomical Study. Hand (N Y). 2017 Feb 1. 1558944717692086. [Medline]. Jeyapalan K, Choudhary S. Ultrasound-guided injection of triamcinolone and bupivacaine in the management of De Quervain's disease. Skeletal Radiol. 2009 Nov. 38(11):1099-103. [Medline]. McDermott JD, Ilyas AM, Nazarian LN, Leinberry CF. Ultrasound-guided injections for de Quervain's tenosynovitis. Clin Orthop Relat Res. 2012 Jul. 470(7):1925-31. [Medline]. [Full Text]. Corticosteroid injection for de Quervain tenosynovitis. Right trigger thumb injection. Video courtesy of James R Verheyden, MD. Separate right trigger thumb injection. Video courtesy of James R Verheyden, MD. Medscape Reference thanks James R Verheyden, MD, Consulting Surgeon, Department of Orthopedic Surgery, The Orthopedic and Neurosurgical Center of the Cascades, for assistance with the video contribution to this article.